The Scarlet Tanager is a medium sized American songbird which belongs to the cardinal family. Earlier it was thought to be belonging to the tanager family. The name Tanager comes from the language spoken by the Tupi Indians of the Amazon region. It is also known as Piranga erythromelas, Tangara écarlate in French and Tángara escarlata in Spanish. Due to its bright orange and black feather combination, these monotypic birds are also known as Orange Variant Scarlet Tanager. Let us read about the physical appearance of this bright and dazzling bird. Size and Weight: The length of Scarlet Tanager is around 18 cm. The weight of these medium sized birds varies from 21.5 to 42.5 grams. Wings: Their wingspan is around 11 to 12 inches. Both males and females have white wing lining. The wings are dark and covered with greenish edging. Some adult females have weak wing bars. Color: Non breeding males, females as well as juveniles have dull green backs and yellow bellies. Both male and female can be differentiated by dark wings plus tails. The breeding male has sparkling red all over its body. The wings and tail becomes black during this time. The breeding female has complete yellow-greenish body along with yellow throat and sides. Their tails are dark. They possess a thin eye ring. Their legs are dark colored. Bill: They have smooth, pale colored bills which is short and broad having a thick base. These birds are widely found throughout USA especially in states like Michigan, Ontario, Wisconsin and New Jersey. They spend their winters in northwestern South America. Their summer range stretches across the eastern and mid western part of USA till southern part of Canada. Their migration route passes through Central America during the month of April and again in the month of October. These marvelous birds love to spend their winters in the lap of evergreen mountainous forests. They are amongst the few American song bird species that have evolved to migrate to other parts for breeding. They arrive on the breeding grounds in large numbers during the month of May and begin to move towards south again in mid-summer. By October they are all set to fly southwards. These birds are usually found in dense deciduous forests of oak, hickory, tulip trees, ash, pine and in wooded inhabited areas as well as parks. Let us study the behavioral patterns of these vibrant birds. These birds are solitary and secretive in nature spending most of their time at tree top canopies making it difficult to spot them. When threatened, it mobs its predators by diving and swooping around them and calling simultaneously. Sometimes, they become quiet and observe their enemies (especially American Crows and Merlins) to hide. They keep their nest very clean and tidy. Any droppings on the nest are either swallowed or thrown away using their bill. These birds are highly territorial on the breeding grounds and warn other males by singing frequently. They join other mixed species of birds for foraging on wintering grounds. These birds are primarily insectivorous, feeding on insects like aphids, nut weevils, wood borers, ants, leaf beetles, cicadas, parasitic wasps, dragonflies, termites, caterpillars of gypsy moths and bees. They capture insects by leaning and grabbing while flying, beating them against branches to kill it. They also feed on fruits like mulberries, wild fruits, huckleberries and June berries. However, spiders, certain earthworms, seeds and buds top the list of their food preferences. These birds are excellent flyers with quick reflexes which helps them to catch and eat flying insects. 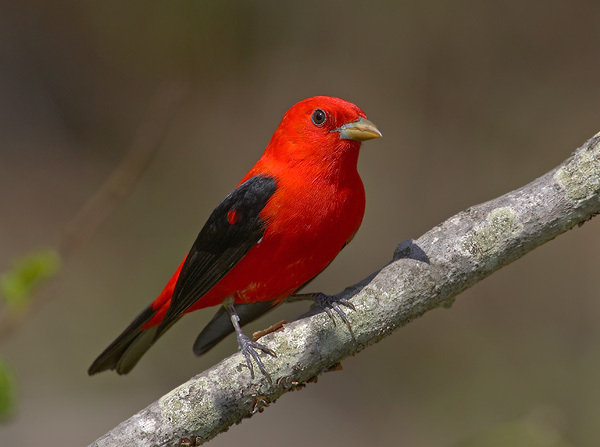 Scarlet Tanager’s has a soft and croaky “chip-burrr” call. During the summer, its Robin-like song of rough notes “querit queer query querit queer” is heard in deciduous forests. The females reply to the male’s calls by singing in shorter but similar pattern. Their voice is, however, much softer and less coarse. They call during territorial fights or if there is any existence of danger. It is followed by drooping wings and snapping of tails. At dawn, male tanagers sing incessantly, mingling calls with songs. Females sing especially while gathering food or materials for building nests. 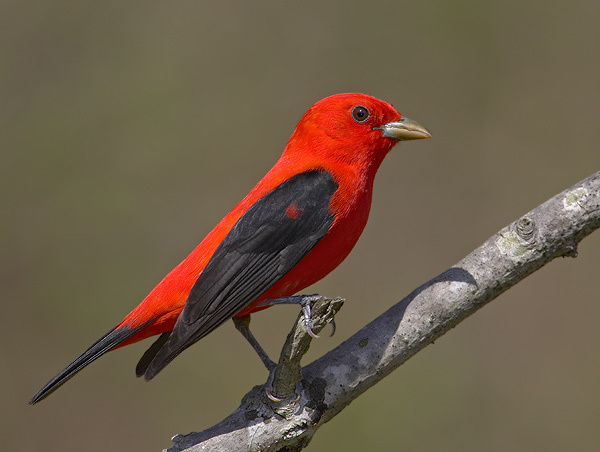 The bill of the Scarlet Tanager has a distinctive tooth-like structure on the cutting edge of the upper jawbone. This enables the bird to eat fruits and ariled seeds. 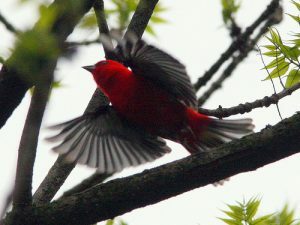 Short-eared owls, eastern screech owls, long-eared owls and merlins are some of the main predators of Scarlet tanager. Predators for eggs and nests include American crows, squirrels, blue jays, grackles, chipmunks as well as snakes. The mating takes place from late April to mid May. These tanagers are sexually dimorphous. The male usually starts singing to attract the females on the breeding grounds. The male sings in alternatively high and low pitch voice before performing its courtship displays from the lower branches of the trees. The male holds its wilted wings and separates the body while its neck is drawn out to exhibit the back. The male finally displays his brilliant color to the female birds. When the female reacts positively and pairs are formed, then these monogamous pair goes on to build their nest and stay as one for a long time. Now after the mating is over, they look forward to build nest. The tanagers prefer to build their nests in parks, deciduous forests, woodlands and suburban areas having large trees. The female then lays three to five pale bluish or green eggs which are delicately and boldly marked brownish. Female incubates the eggs all alone for around fourteen days. The nests are built by the females in around two weeks. Located at around 5 to 75 feet above the ground, the nests require around a cup of twigs, grass and stems to build. The nests are built on horizontal branches. They make the nests in such a way that clear open flyways are accessible from adjoining trees to the nest. The saucer shaped nests are usually shallow. During this nest building and incubation phase, the male is unable to assist female as its brightly colored plumage may draw enemies putting them in danger. The young birds leave the nest within nine to eleven days after hatching. The male aids in feeding the babies. The juvenile has light red or orange colored body. The oldest known specimen of a scarlet tanager in wild lived for 10 years and a month. 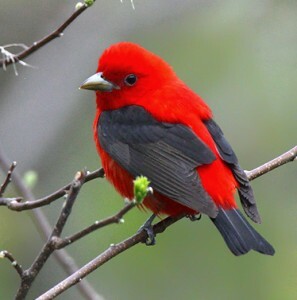 Scarlet Tanager is categorized as “Least Concern” by IUCN. However, their population is in decline in certain regions as a result of habitat destruction and might be pushed to become endangered. Being an insectivorous bird, they are not so popular as pets. However, if one wishes to keep them as pets, attention and care should be given to their birdhouses keeping in mind their habitat requirements. The Scarlet Tanagers nest must be located in a coniferous deciduous tree, which is six to nine meters above ground. It should be placed on a horizontal branch. Preferably the nest can be built at the junction of 2 or more small branches along with the main horizontal branch. The nests should have a leaf cluster with lots of shade and the view should be unobstructed, so that they can fly with ease. There are some interesting facts associated with this dazzling bird. It is the only species of Tanagers which undergoes seasonal changes in its plumage. After each fall, the male changes its marvelous beautiful red and black plumage to olive green just like the plumage of the female. 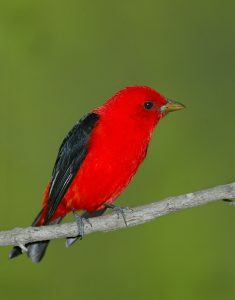 This is the only bird in North America which has a combination of bright scarlet as well as black tail and wings. They joins other species to forage on the wintering grounds of South America. One Scarlet was known to have consumed six hundred tent caterpillars in just fifteen minutes. Rare sightings of these birds have been reported in parts of United Kingdom like Cornwall. Let us take a close look at these bright, colorful and attractive song birds. Hi, I found a scarlet tanager egg and I have it under a heat lamp right now. Once it hatches what do the baby birds eat? And how much do you give them?